Farmers markets are a great source of nutritious produce. SourcePoint’s popular voucher program provides Delaware County residents age 55 and older, who meet eligibility requirements, with vouchers to purchase fresh fruits and vegetables. Voucher distribution starts Thursday, May 24, and Friday, May 25, with a two-day event at SourcePoint, 800 Cheshire Road in Delaware. SourcePoint’s popular farmers market voucher program will launch Thursday, May 24, and Friday, May 25 with a two-day distribution event. This program provides Delaware County residents age 55 and older with vouchers to purchase fresh fruits and vegetables, herbs, and other foods from participating markets in Delaware, Galena, Powell, Sunbury and Westerville. Participants will receive 20 vouchers for a total value of $60. 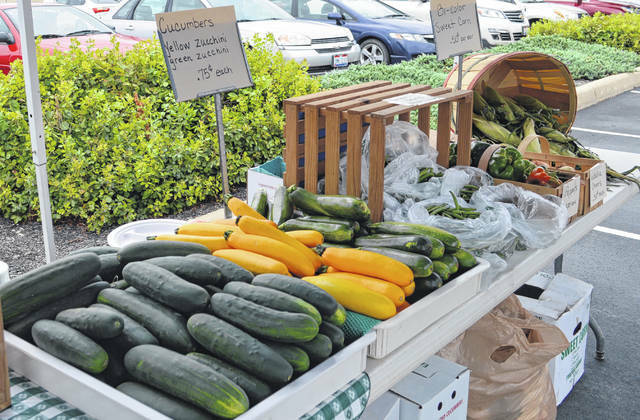 Vouchers may be used at the Main Street Delaware Farmers Market, Powell Farmers Market, Sunbury Farmers Market and Uptown Westerville Farmers Market. This year, vouchers also will be accepted at Buell Homestead Farm Market in Galena, Delaware County Community Market in Delaware and Miller’s Country Gardens in Delaware. Applications will be available and vouchers first distributed at SourcePoint, 800 Cheshire Road, Delaware on Thursday, May 24, from 9 a.m. to 3 p.m., and Friday, May 25, from 9 a.m. to 1 p.m. After the initial distribution event in May, vouchers will be available at the Delaware, Powell, and Sunbury farmers markets beginning June 2, and at SourcePoint on weekdays between 9 a.m. and 3 p.m., beginning June 4. Vouchers will be distributed while supplies last. Delaware County residents age 55 and older who meet the following requirements are eligible for free vouchers: You are a single individual with an annual household income up to $24,280 or part of a couple with an annual household income up to $32,920, and you do not reside in a nursing home or facility where meals are provided. To learn more, go to MySourcePoint.org or call 740-363-6677.